Douglas Raguse has been active as a bow maker and restorer for more than three decades; he has made more than eleven hundred bows to date. Douglas studied violin with George Zazofsky and Louis Krasner at the University of Miami School of Music before he was introduced to bow making by noted bow makers Lloyd Liu and William Salchow. Douglas maintained a bow making studio in Chicago from 1977 -1996. 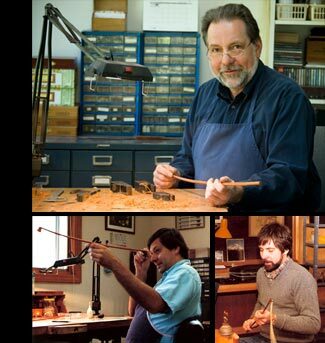 He established a studio on Michigan's Leelanau peninsula in 1996 where he continues to make and restore bows. Douglas participated in a number of bow making competitions from 1978 - 1988. He won a total of twelve awards for excellence in bow making during that period. Included is a Gold Medal from the Violin Society of America in 1980 and a First Prize in 1986 from the American Federation of Violin and Bow Makers. Douglas has twice served as a bow workmanship judge for the VSA International Violin and Bow Making Competitions: first in 1992 at Carlisle, Pennsylvania and again in 1998 at Salt Lake City, Utah. He also served as a bow judge for the 2003 International Society of Bassists Competition.